Wins are calculated from readers’ shares and comments. 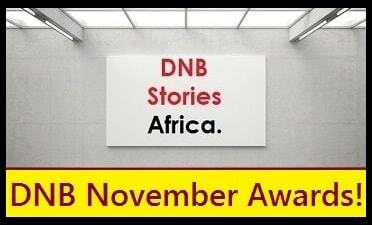 DNB Stories appreciates you all and wishes everyone a beautiful new month. I fully concur on the most outstanding reader of the month! Nma, a big congrats to you and more mb to your device! Congrats to all the winners, more especially Troy Onyango my successor for this month. Hahahahhaa! My ba3 was low since yesterday, after I managed to read Entangled. I just charged and am seeing this good news! Wooooooooow! Am now a celebrity. Thanks to u all n thanks to DNB for dis honour. @ Iyke I av succeeded in beaten u dis month. Am so happy! lolz! nne, no one is unbeatable here! Am still dancing ooo! What an honour. Congrats guys. It all a deserving win. Please hw can I get an I.d? Hello. You can do that by getting a Gmail account at www.gmail.com. Just make sure you are logged on in the same browser you are surfing DNB with. Alternatively you can select the Name/Url option and input your name yourself and use the link to your Facebook or Twitter in the URL part. Wow! It's really an honour to be one of the winners. Congrats to all other winners. Thank u @dnb family. Thank you dnB team. I had to jeep checking my name since morning to make sure I wasn't dreaming, this has encouraged me to keep penning down good stories till thy kingdom come O lord. Meanwhile, isn't there prizes this month to be given? E-hug is better than monetary or material prizes! We suspended prize-gifting because winners living outside Nigeria complained of being cheated. And it is understandable. This feature will be restarted at a later time as soon as we are able to enlarge prizes and make them global and no longer Nigerian-only.